A nicely written article at FairMormon Blog discusses mistaken claims made by those critical about Handbook 1 revisions. It is understandable that good and faithful people may have questions about how this new policy will be administered. We encourage any with questions to study the scriptures, reflect upon what apostles and prophets have to say on the matter, ponder and pray, exercise patience, and look deeper than the slogans, memes, and sound-bites. Throughout the so-called "Bloggernacle" are very few examples of discussion defending the Church of Church leaders. The comments tend to be decidedly negative and critical. Of all the blogs participating there, the FairMormon Blog is one of the best to follow. I also am usually uplifted by posts at the Millenial Star blog. Most of the others are simply not worth reading any more. I occasionally waste my time searching for anything lovely, of good report, or praiseworthy. I seldom find anything that qualifies any more. 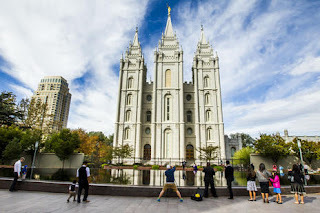 It is interesting to note that Bloggernacle coverage of addresses given at the recent General Conference garnered little interest and few comments. Few threads lasted much beyond the closing prayer. By comparison, gripes about the Handbook 1 revisions have reverberated through the "Bloggernacle" unabated since the instant the administrative revisons were leaked for public criticism weeks ago. In spite of the fact that administrative policy is not properly the concern of the general body of the Church, the continuing stress and criticism shows no sign of easing. I am surprised every time to learn how faithless and fickle public opinion can be.